I didn't get to blogging last night because I met up with someone for dinner and drinks. Didn't get home until after 1:00am. Ugh! I can't remember the last time I did that. That's way to late for this old girl. I had a question in my comments about the designer of the Rad to the Bone dress from ModCloth, I'm guessing since it's sold out. It's from Folter clothing. I don't see it on their website though. Maybe it's a ModCloth exclusive? So I live very close to a funky shopping area - West Queen West (which is different from Queen Street West as it is more....westerly?) I've been walking to work and it takes about 40 minutes to get to work but coming home takes about 1.5 hours since I keep going in and out of stores. 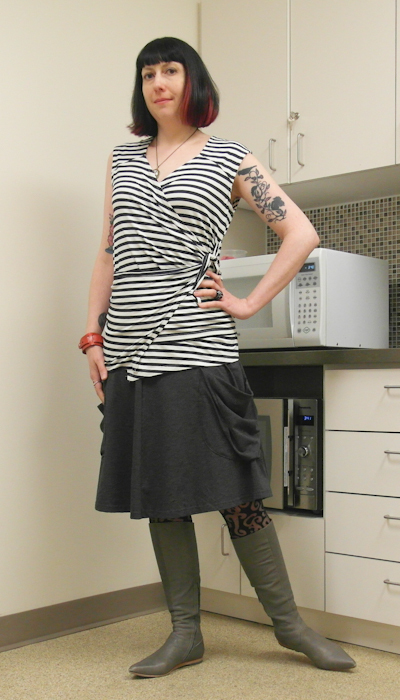 On Friday I wore a few new things that I bought from stores selling locally or Canadian designed and made pieces. Love, love, love this skirt. I wore it all day, then when I went out last night and I'm wearing it right now. Whoooo! The top is made by the same company as my skants! It is a wee bit awkward and I kept futzing with it all day to try and get it arranged how I wanted it but I think I finally wrestled it into submission. So I just got back from signing my lease on my new place! After my terrible shoebox apartment experience I was starting to think I had made a horrible error in moving here. On Wednesday I was feeling quite despondent. Then at about 3:30 I got an email from a person I had contacted on Craigslist a few weeks ago and had never heard from. She asked me if I was still interested in seeing the apartment. So I called her and got the details. It was for a place that is extremely close to where I'm staying right now and in a house as opposed to a building. 900sq/feet, walk in closet, small but useable kitchen, laundry on site, all utilities included for less than $1000 a month. What's the catch? It's in a basement. I haven't lived in a basement apartment since 1995 right after I finished university. I went to look at it anyway. The owners are so nice, the area is exactly where I want to be, the house is on a quiet street, the price was right so I've chosen to take a risk and go for it! I'm hoping to not spend a whole lot of time in it anyway - I'm hoping to be much more social now that I'll be living in the big city with lots of things to do. For example, today I'm going to mosey up to the Bazaar of the Bizarre on Bathurst Street. Ruby Nite (Nicole) told me about it in a comment on my last post. It's a short walk from here to the subway and then I can take the subway just a quick ride to Bathurst. Should be quite an adventure. I'll take my camera and hopefully take a few pictures. Maybe I should wear my skeleton dress? I love Fresh Collective. I was right by there yesterday after work but I made myself walk on because it's too dangerous. Hurrah for the new home news! That is really great. I would trade a bit of light-loss (dependent on no. of windows of course), with nice neighbours/landlord. I get quite a lot of light but have horrid neighbours and would prefer the opposite. Your new clothes are lvely, particularly the pockets on your skirt, they hang so beautifully fold-y. I lived in three basement apartments, and didn't really mind them. Two had pretty big windows, and the third, well, let's just say that year was a bit of a haze. I feel jealous hearing about exploring a new city. And had to laugh at the time it takes you to walk home - it sounds like so much fun! I'd love to take the sub- off my suburban life and live in a real city again. If you walk past Fresh Collective than I have an idea of the area where you live. Congrats on the apartment - finding something under $1000 in a nice area is a treat. If you head farther west on Queen to Parkdale, there are some cool stores, including a vintage store called Stella Luna that had nice stuff at very reasonable prices. Yay, congrats on the new place. I've only ever lived in a few places, so never a basement suite. I hope it works well for you. Sounds like you have some excellent shopping! Get some walking shoes - don't ruin/wear out your good ones. Hey! I went to Toronto for the first time last year and tried on that very same skirt. Did not buy it because I had just gone into Fresh Collective and tried on practically every item in the store and bought several, one of which I am wearing right now. Such a great neighborhood. Yay to finding a place bigger than a closet that isn't too pricy! The last place I lived in before I left Toronto was a basement too. It wasn't advertised as such or I wouldn't have checked it out. So glad I did. Close to Roncesvalles, High Park, and the College St. Street car. Location is everything. So glad you're in such a walkable area. Damn I miss that town! I love how it takes you twice as long to get home because you stop in all the stores!